세월호 참사가 일어난 지 벌써 다섯 번째 봄, "워싱턴 세월호를 기억하는 들꽃"(이하 워싱턴 세들꽃)은 지난 7일 (일요일) 오후 2시 링컨 메모리얼 기념관 앞 계단에서 세월호 참사를 기억하고, 眞相(진상) 糾明(규명)을 요구하는 추모 행사를 열었다. 워싱턴 세들꽃은 "세월호와 함께 걸어요"라는 주제로 해마다 4월이면 워싱턴 디씨의 가장 유명한 상징물 중 하나인 링컨 메모리얼 앞에서 추모 행사를 열어왔다. 올해 행사에서는, 지난 3월 28일, '사회적 참사 특별 조사 위원회'에서 발표한 바와 같이, 세월호 DVR( CCTV 영상이 녹화된 저장 장치)이 바꿔치기된 정황과, DVR을 바꿔치기하면서까지 감추어야 할 진실이 무엇인지 밝혀내야 한다는 것을 알리는데 힘을 실었다. 이를 위해서는 반드시 세월호 참사 특별 수사단을 설치해 세월호 참사에 대한 전면 재수사를 해야 한다고 강조했다. 행사는 세월호 노란 리본 나누기, 세월호 진상 규명에 대한 바람 적기, 세월호 참사 특별 수사단 설치를 위한 국민 서명, "어둠은 빛을 이길 수 없다" 노래 함께 부르기, 한 초등학교 6학년 학생의 "잊지 않을게" 비올라 연주, 워싱턴 문인회 김행자 씨의 시낭송, 성명서 낭독 (국문, 영문), 자유발언 등으로 진행되었다. 자유발언 중 한 참가자는 세월호 참사가 일어나던 첫해부터 매년 꽃이 피는 사월이면 이 자리에 설 수 밖에 없는 아픈 소회를 밝히고, 내년 4월은 정확한 진상 규명으로 더이상 아픈 사월이 아니길 소망한다고 말했다. 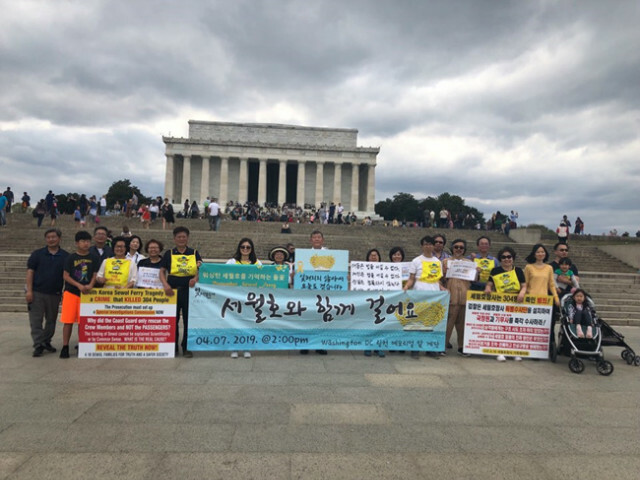 행사의 마지막 순서로, 모든 참가자들은 희생자 304명의 이름을 한 명 한 명 기억하고 부르면서 리플렉팅 풀 둘레를 함께 행진했다. 한편 4.16해외연대, 전세계에서 세월호 참사 5주기 추모행사에서 아래 지역들이 추가 또는 변경되었다. Frankfurt 4/16/2019 7PM @ Koreanisches Kulturzentrum Walter-Kolb-Str. 5-7, 60594 Frankfurt am Main 세월호 5주기 추모와 크로스로드 < CrossRoads> 상영회 Punggyeong Weltkulturen e. V.
Seven million signed the petition and 17 million people came out to the candlelight vigil, demanding the special investigation for the Sewol Ferry disaster. However, the truth of Sewol ferry tragedy has yet to be revealed. 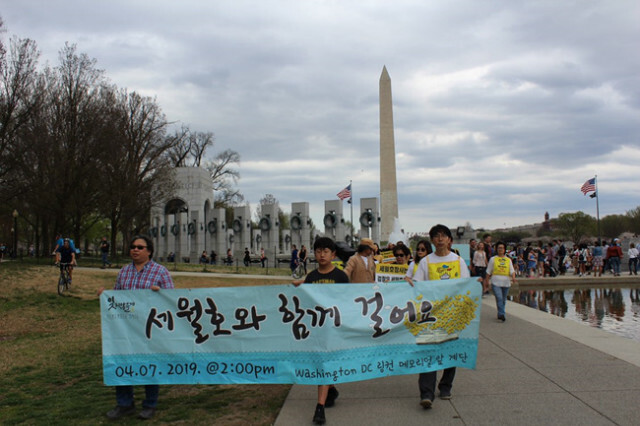 On March 28, the Special Investigation Committee announced that there were speculations that the storage device containing the CCTV image was manipulated by the coast guard and the navy at the time of the Sewol Ferry disaster. This announcement reaffirms that the disaster was a genocide. This current government was elected by the people who held the candlelight vigil. They should uphold the demand of the people who have chosen them as our leaders, and identify the reason why 304 people were buried under water, and punish the people in charge of this crime. The Army Command has conducted an illegal inspection from the first day of the disaster, delayed the salvage of the ferry, concealed the evidence, and meddled illegally in the investigation. 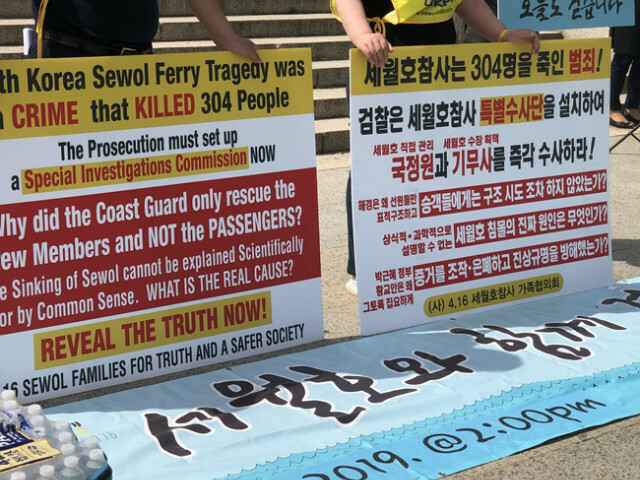 Special Investigation Commission must be set up to investigate the alleged cover-ups of the coast guard and the navy, and must carry out a full re-examination of the Sewol ferry disaster. The concealment of the crime and attacking the victims were second and third assaults against the victims and their families. The former President Park, Geun Hae did nothing during Golden Time to rescue the victims. And the former Prime Minister Hwang Kyo-Ahn who was the acting President after Park’s impeachment concealed the related records by sealing them as the Presidential records. ▪️ Form the Special Investigations Commission Now! ▪️ Investigate the coast guard and the naval personnel involved in concealing the evidence! 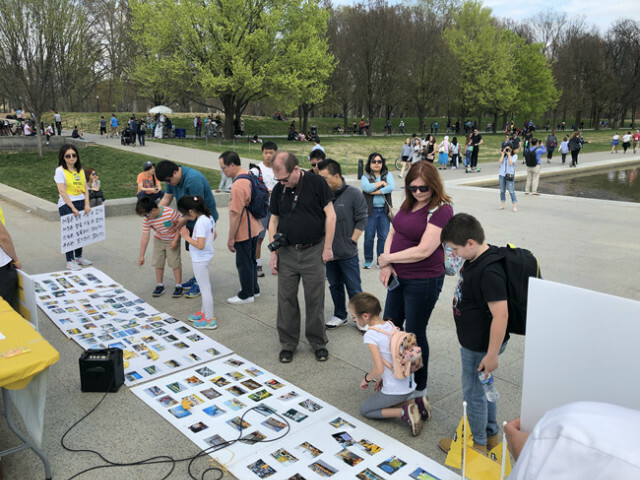 ▪️ Reveal the record of Park Geun-Hae’s seven-hours during the first part of the Sewol disaster recovery!